As a companion or pet, or a source of livelihood, or just a keepsake trophy, humans have had some kind of an unbreakable bond with animals, whether a bond of compassion, or subjugation. For those who went on hunting, it wasa symbol of power to show off their prized trophies, their hunt, to awestruck admirers. To have conquered rare and ferocious animals was no mean feat, and kings and royalty would have their exploits stuffed and kept for a grand display. Taxidermy, the art of preserving animals in their original shape and form was a service of luxury, sought of only by the conquerors. Such hunting expeditions and possession of wild animals may have been the indulgence of the rich, but the inventive craftsman found a way for common man to have it too. 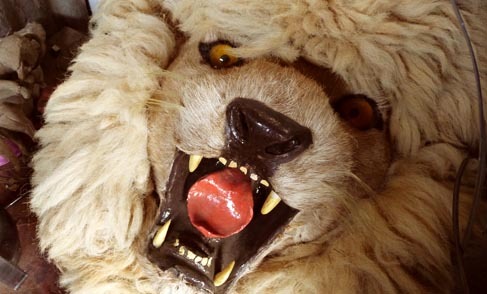 The clever taxidermist, who sometimes also combined two different animals to make figures of mythical beings, made creatures of the wild accessible to everyone. 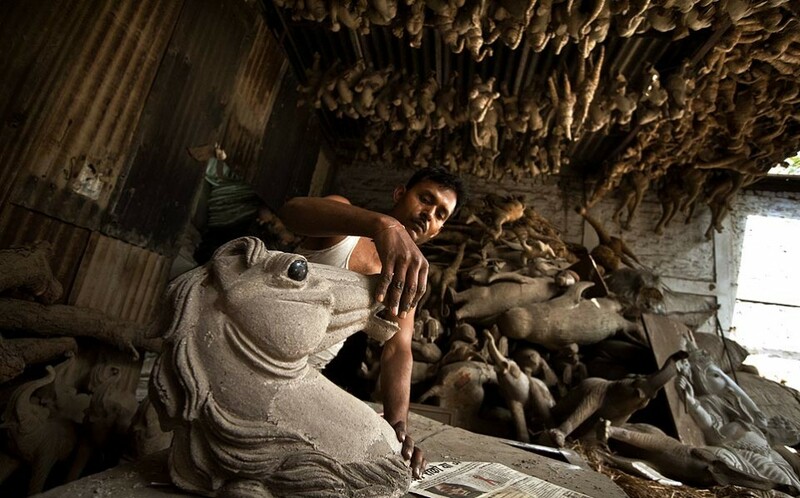 Making lifelike sculptures, not with rare tiger skin, but with leather and painting them with true to life colours, he made the commoner have a piece of luxury in his home. 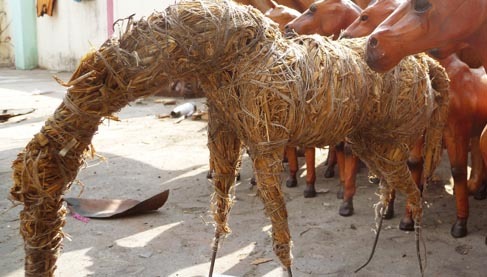 This art of creating life like animal statues from leather is now practiced inIndore, Madhya Pradesh. 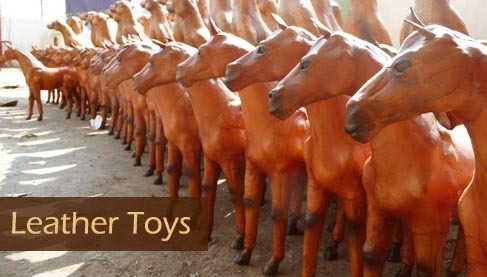 Craftsmen and their families practice this art and create miniature to life size versions of all types of animals, from horses, cows and elephants, to lions, tigers and rhinos of the jungle, to exotic creatures of the wild, like giraffes, zebras and meerkats. From a mere photographic reference, the craftsmen can make an accurate sculpture of the animal, complete with the details of posture and muscular curves and then paint them with lifelike colours depicting the skin patterns. Starting with the basic skeleton, craftsmen first make an armature with steel wires to act as the frame on which rest of the material will be supported. This is covered with tightly packed hay or waste paper, bound with strings to hold it together. This forms the body of the animal, which is then covered with cardboard pulp and given definition. On this soft outer cardboard covering, craftsmen and women shape the fine details of the animal’s anatomy, its muscular structure in different poses, to great accuracy. It is this expertise of the artisans to understand the structure of animal from a photograph and bring it out in three dimensions that makes this craft so remarkable. Once the cardboard dries, it can be coated with goat leather when required. Wet leather is beaten to increase its softness and flexibility. Using tamarind seed glue as adhesive, the craftsmen cover the animal structure with leather, taking care not to leave any unwanted wrinkles or folds. So neat is the leather coating, that it is difficult to find its edges. 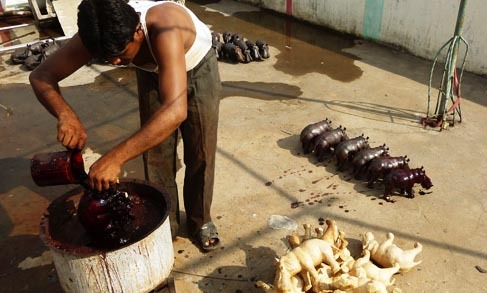 Once dry, the animal figure is dipped in dye and sun dried. The eyes and horns, which are made of glass or plastic, are then attached to it. And then, these artists add finishing touches of shading and painting the details of spots, stripes or patches on the animal’s skin, making it appear amazingly realistic. A final coat of leather polish completes the process. 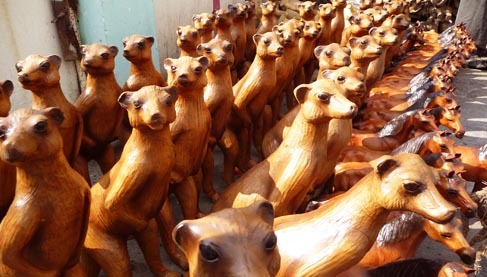 These leather animal figures now find a large export market, and also make popular souvenirs for both locals and international visitors. For those who want a slice of royal luxury in their drawing rooms, or those who want to see beings of the animal kingdom in their realistic glory, these leather sculptures fulfill the desires, without asking too much in return.